Mike Ravono is TCAP’s Finance Associate with over 10 years of financial management experience across a broad array of industries. He is a qualified Chartered Accountant having worked in one of the big four Chartered Accountant firms before he joined UNDP in 2014. 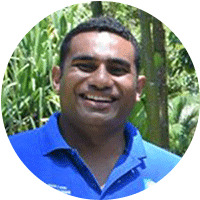 He completed his Post Graduate Degree in Accounting from the University of the South Pacific and also has a Master Class Accreditation in Investment Risk Governance.